There are 6 secrets and 18 flowers hidden within the game. You will know when you found a secret, a yellow glow will appear and you will hear a chime. You can complete the game without discovering most of the secrets or finding all of the flowers. This walkthrough will include the locations of all of the flowers and all of the secrets within the gameplay. There will also be a separate section just for flowers and secrets. Notice the changing cursor. Even if you can't click on something yet, if you see a changing cursor, you may be able to use an object on it. The cursor will also change at the sides, top, and bottom of the screen to indicate that you can move in that direction. You begin at a lovely stream. There is some sort of mechanism here, but although you get a changing cursor clicking on it accomplishes nothing. Just to the right of the machine is a pile of rocks. Click on the pile of rocks twice to reveal a mallet. Take the mallet. Hover your cursor to the right until it changes to a hand and click to move right. You are now at the edge of a precipice. On the left is a large rock, precariously balanced. On the right you can see a faint groove in the grass. 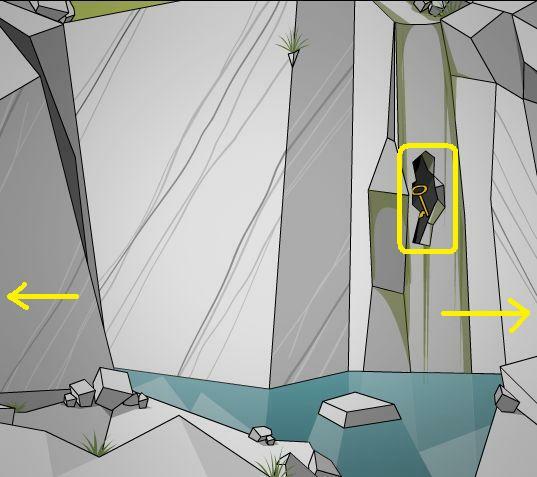 Click on the large rock and it will slide down the cliff. Once the rock is gone you will see another groove in the grass on the left side. Looks like we need to find something to act like a bridge before we can go further. Go left to the stream, then left again. Here you will find some sort of stand, probably for a telescope. However, the telescope appears to be missing. There are also two yellow flowers in the scene, to the left and right of the stand. Take them (flowers 1 and 2). Hover your cursor at the bottom left of the scene and click to go down. You have come down some stairs to the quarry floor. Laying on the stairs you will find a telescope, take it. 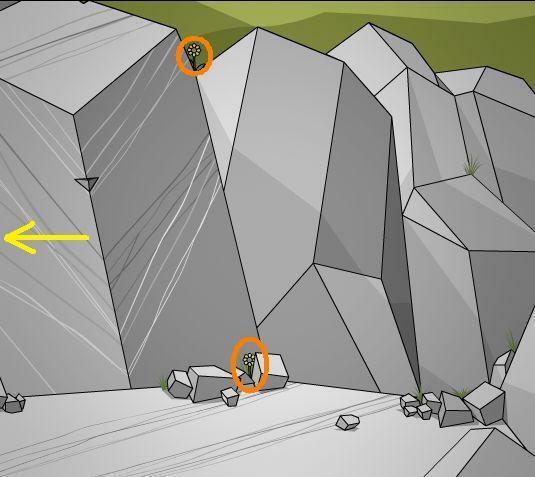 In a rock notch to the right you will find a chisel, take it. There are two flowers here, one on the stairs, one on the right just to the left of the chisel (flowers 3 and 4). Once you have picked up all of the items go right. You have just found a lovely waterfall. Notice the key behind the falling water, but you can't take it yet. In the lower right of the scene, submerged in the water, is a wooden wheel, take it. 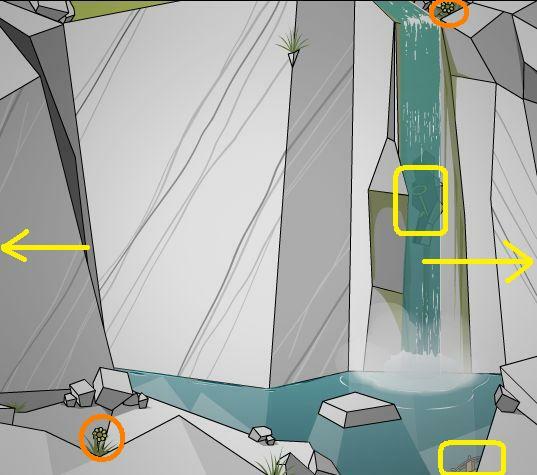 There are two flowers in the scene, one on the left on the rocks, one above the waterfall in the upper right (flowers 5 and 6). Once you've taken the wheel and the flowers, go right. You are now at another chasm. Isn't it nice that the large rock you dislodged from above is now creating a walkway over the chasm? There are two flowers here, one on the lower left, one in the rocks in the upper right (flowers 7 and 8). Once you take the flowers go right. 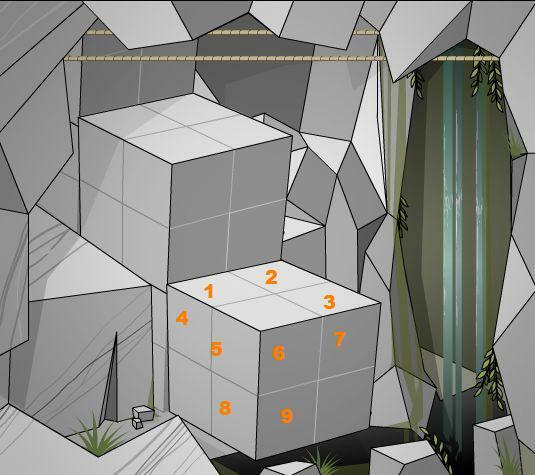 You are now at an area that looks like a cave entrance, but the way is blocked by 3 large blocks. Your cursor changes to a hand on the blocks, but you can't do anything with them at the moment. Just to the right of the blocks, in a niche in the wall, is a large plank of wood. Take the wood. You have now reached a dead end. There are two flowers here (flowers 9 and 10). Once you take the flowers, it's time to solve some puzzles. From the dead end, go left four times until you are at the stairs, then go up. Place the telescope on the stand. It will be horizontal at first. Click on the left side of the telescope and you will see what looks like a unicorn with its horn cut off. 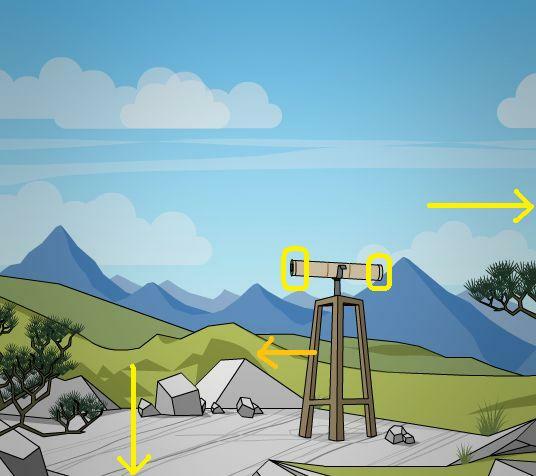 Click on the right side of the telescope and it will point to the mountains. 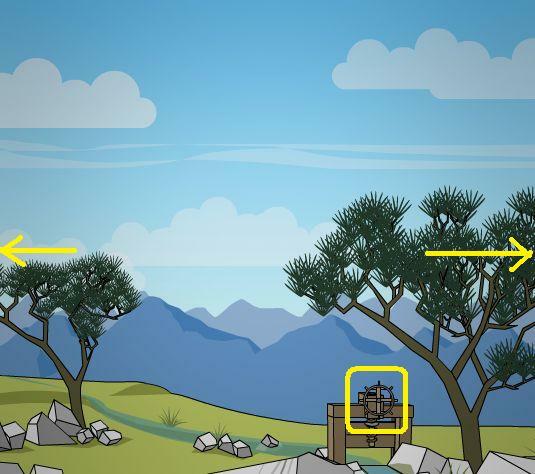 Click on the right side again and you will see the mountains in the telescope (secret 1). Back out of the telescope view. If you click on the base of the telescope it will slide to the left, revealing a faint circle. You should now be back at the stream. Use the wooden wheel on the wooden device on the stream. Once the wheel is on, click on it to turn and the device will cut off the stream. You are now back at the gap. 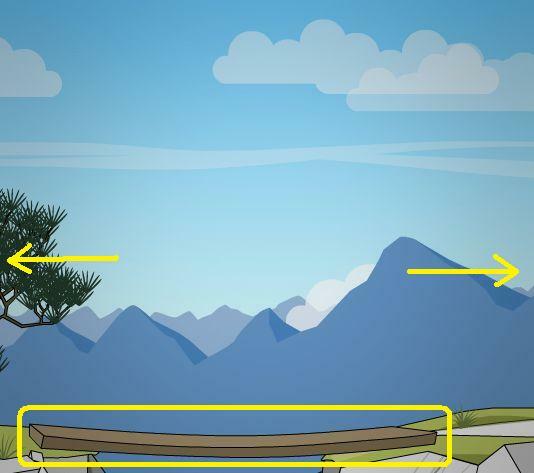 Use the large wooden plank on the notches over the gap to create a bridge. Once the bridge is in place go right. You have now found a poor mutilated unicorn. Notice he is missing both wings and his horn. 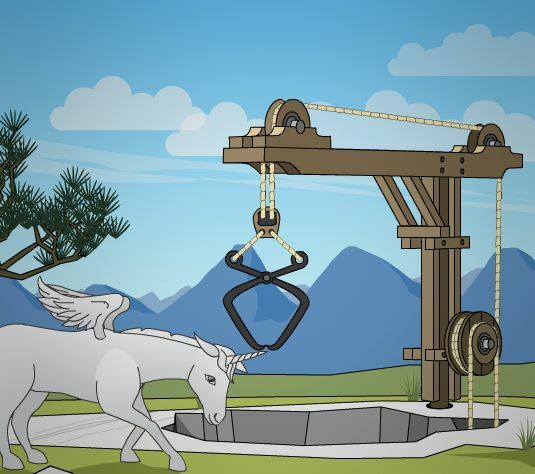 If you click on the unicorn he will explain that he would like his wings and his horn, and he will point to the right. 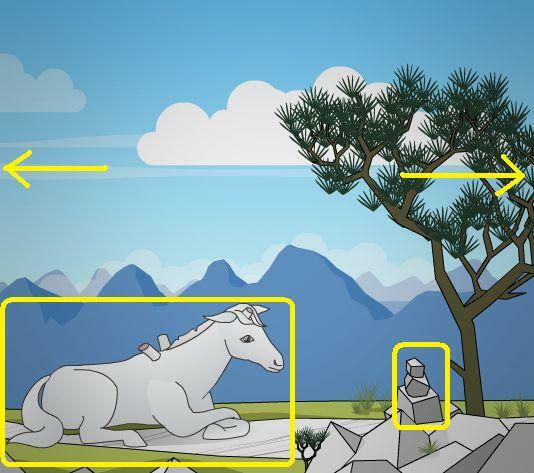 To the right of the unicorn is a pile of rocks. Click on the rocks twice to uncover a gold florin. Take the coin. You have now found a crane with a grabber over a hole in the ground. Pinned to the crane with a knife is a note. Click on the note to take it and read it, then click on the knife to take it. If you accidently click on the knife first the note will fall into the hole. Don't worry, we can retrieve it later. Click on the note in your inventory to read it. The note says to ride Bruno to the garden. Presumably Bruno is the crippled unicorn. Looks like we'll need some unicorn first aid. At the base of the crane is a flower (flower 11). Once you have the note, the knife, and the flower it's time to solve some problems on the quarry floor. From the crane, go left four times to the telescope, then go down to the stairs. Once you are at the base of the stairs, go right. Notice that the waterfall has stopped. You can now take the key. Go right twice to the cave entrance. In your inventory click on the chisel to pick it up. Once you have the chisel, place it on the mallet in your inventory. This will combine the two. 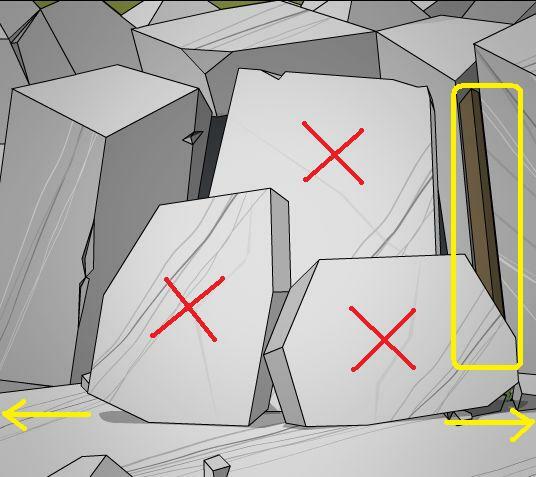 Use the combined chisel/mallet combo on each of the three large rocks blocking the entrance. It will take 3 hits on each rock to break them down. 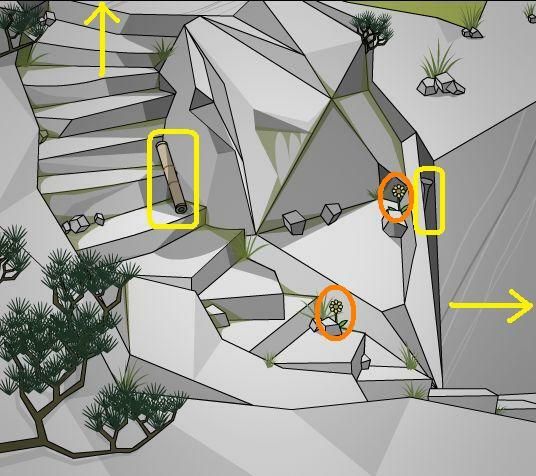 Once the rocks are gone you will find a flower in the lower right of the scene (flower 12). 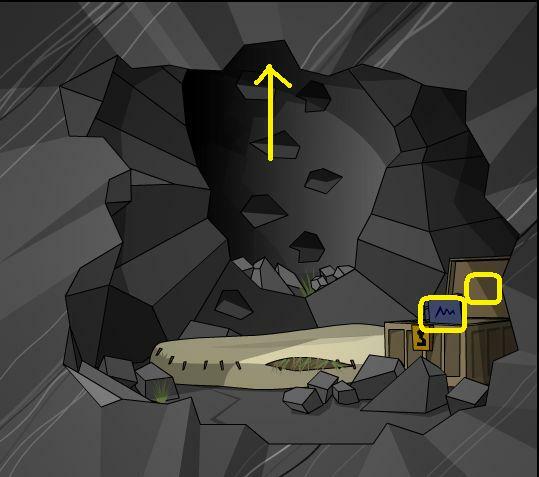 Click on the cave entrance to enter. You are now on the upper level of the cave at the base of the stairs. Here you will find another grappling hook. There is a flower on the floor near the base of the stairs (flower 13). Here you are at a dead end. If you look closely at the pulley system, you will see ropes going up. 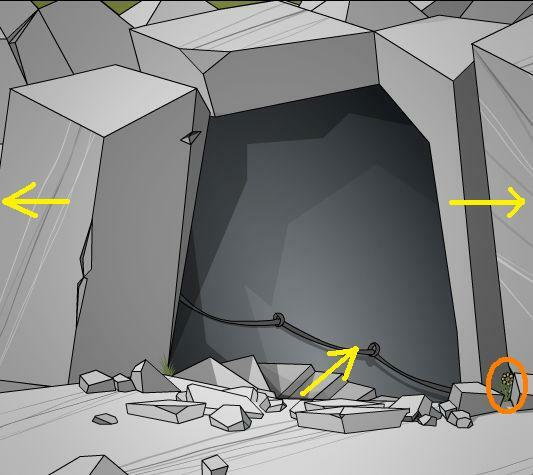 This is where the grappling hook from up top connects with the cave's grappling hook pulley system. If you accidently took the knife first up top, you will find the note in the small tree growing in the upper left of the wall. If you already have the note you don't have to worry about it. There is a flower here in the lower left (flower 14). You have found the controls for the grappling hooks. 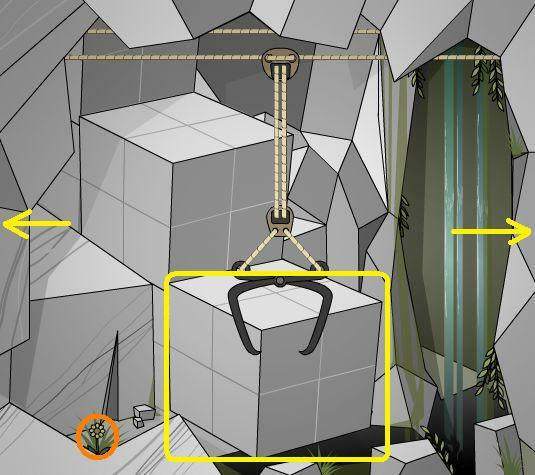 These control the cave grappling hook. On the left console are two levers: the lever on the left opens and closes the hook, the lever on the right raises and lowers the hook. 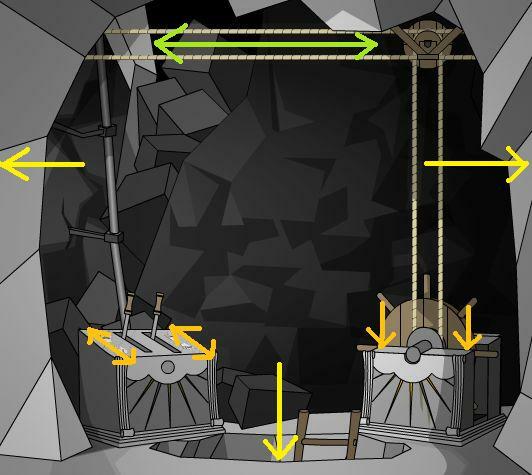 The right console controls the horizontal movement of the cave grappling hook. 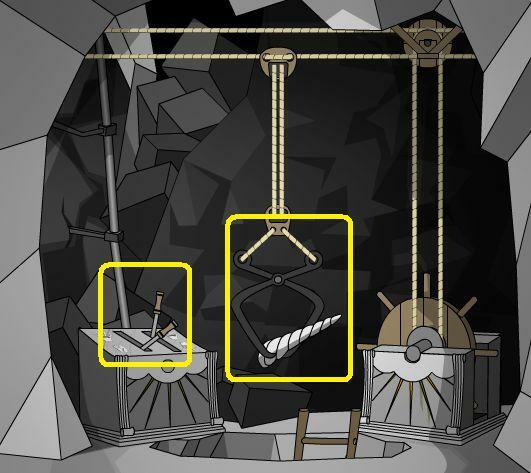 Click on the left side of the wheel and the hook will enter the room. Click on the left side of the wheel again and it will move to the left. There is a hole in the floor with a ladder leading down. You are in a strange room with very square looking blocks. Notice the waterfall on the right. On the lower left is a flower (flower 15). You are in another room with square blocks, this one without a waterfall. This is also a dead end, you cannot go any further left. There are two flowers here (flowers 16 and 17). Once you've got the flowers, it's time to explore the lower level. Go right twice until you are at the controls for the grappling hook. Click at the bottom of the screen to go down the hole. You are now at the base of the ladder. Notice the track running through the scene. To the right of the ladder is a small rock. Click on it to move it and take the revealed item (gold florin). You can now see the sled on the track. Go right. You have reached a dead end and the end of the tracks. Notice the ropes going up. 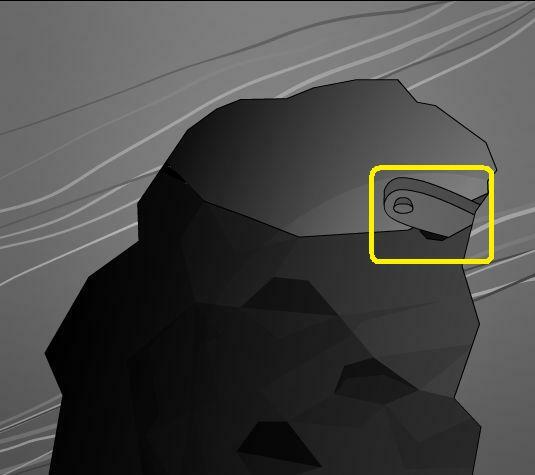 This indicates that the sled is also tied into the grappling hook controls, and that there is an opening above. Go left twice to the ladder, then left again. You are at the base of a waterfall. On a rock in the foreground is a piece of paper, take it. Once the paper is in your inventory, click on it and you will see blocks with patterns on them and items like a unicorn horn. Instructions! On the tracks is a gold florin, take it. 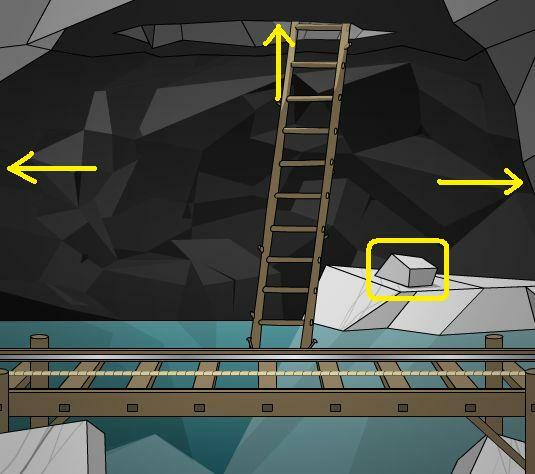 Note: If the sled is in this scene, go back up the ladder and move the grappling hook left or right then come back again and you will see the coin. You are now in a cul-de-sac. There is an entrance in front of you across the water. 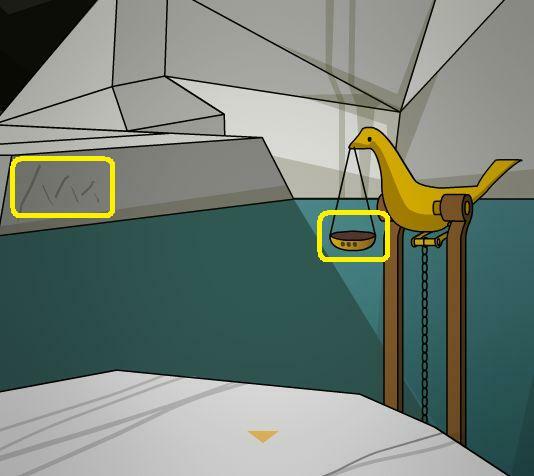 There is a small gold bird figurine holding a scale. Notice the note in the scale. Take the note and it will attach itself to the one in your inventory. More instructions! You now have instructions for a horn, a wing, and a hand. Click on the bird for a close up. Notice that the scale the bird is holding has three dots on it. You will also see the symbol for a mountain on the rock across the water. If the gold bird wants three items, what can we give it? How about the three gold florins in our inventory? Place the three gold florins (coins) in the dish one by one. Notice that stepping stones will appear with each coin added. 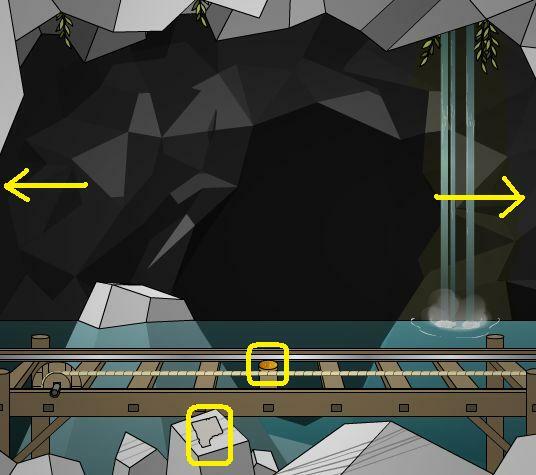 Once all three coins are placed you can click on the mountain symbol and travel across the water. You are in an alcove, with handholds leading upwards. There is a flower here (flower 18). At this point you should have all 18 flowers. There is mattress in front of the alcove. Hover your cursor to find a clickable spot, then use the knife from your inventory on that spot to slice it open. Take the revealed item (another scrap of paper). You should now have directions for a foot. 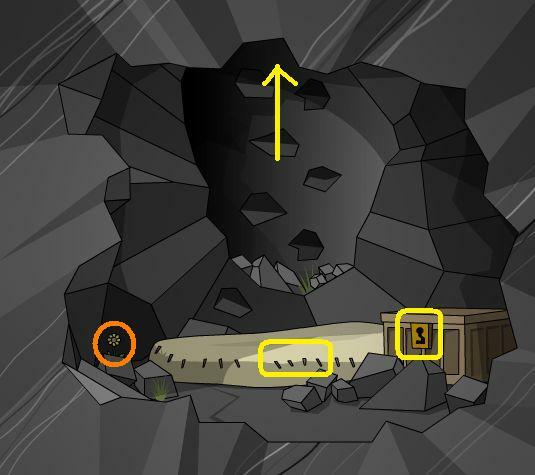 Use the key (from the waterfall) on the box on the right to open it. There is a blue book inside the box, take it. It will combine with the note pieces in your inventory. There is a faint square on the inside of the box lid, click on it. A secret compartment will be revealed. Take the note that is inside (secret 2). This note (secret 2) will not join the book, but will show instructions for a ram's head and the head of a man. Click on the book in your inventory for a close up. Click on the right side of the book to open it. Notice you are now only missing one scrap of paper. Click on the right side of the book to close it so that you see the back of the book. 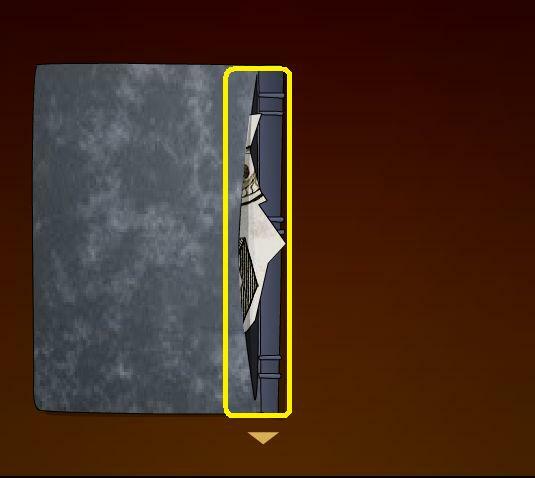 There is a clickable area on the back of the book near the spine. Use the knife on this area to reveal a scrap of paper. Take the paper (secret 3). Your blue book should now be complete, with instructions for a horn, two wings, a hand, a foot, and a female head. Close down the book and go up the alcove. Keep going up until you get to the top. There you will find a trap door. There is a lever on the door, click on it to release the door. Once the lever has moved, click on the door to open it. Note: This will not work if you did not move the telescope stand to the left. Go through the trap door and you will find yourself standing by the telescope up above. Time for some unicorn first aid! If you are still at the telescope, you need to get to the room with the blocks. Go down the hole, down three more times, back to the gold bird, right twice to the ladder, then up the ladder. Once you are at the grappling controls, go left to the block room. Note: You can use the blocks either in this room or the one to the left, it doesn't matter. Just remember which one you used so you know where to send the grappling hook. This walkthrough will presume you use the block room with the waterfall. Now you need to carve some replacement parts for Bruno. Three of the secrets are also carvings: the female head, the male head, and the ram's head. When carving the objects look closely at the drawings. Some of the blocks have diagonal lines in certain areas, some have vertical or horizontal. Hit a square once and you get diagonal lines. Hit a square again and the lines will shift, but it will also affect other squares. Bruno's replacement parts only require one hit per square, the secrets require a certain combination of hits. Let's start with the secrets first. Some of the squares in the ram's head need to be hit twice, some once. Pick up the mallet/chisel combination from your inventory. Follow the sequence in the screenshot below. You have found secret 4! Click on the head and the blocks will fall down, covering it. You now have a fresh block to start anew. The female head is one of the easiest to do. As indicated by the screenshot below, simply hit the one square five times. You have found secret 5! Click on the head and the blocks will fall down. With the male head you will only be working with the blocks on the top of the cube. The first three blocks only need to be hit once, then the fourth block needs to be hit five times. You have found secret 6! Once you've carved all of the extra stuff (the three secrets, and you can do the hand and foot if you want, but they are not useful), it's time to carve the stuff to help Bruno the crippled unicorn. You should still be in the block room, and you should still have the mallet/chisel selected. Start with the horn. Each square for the horn only needs to be hit once. Note: when carving Bruno's parts the order is not important, just that you create the pattern with only one hit per square. There should now be a unicorn horn sitting there. Go right to the control room. The grappling hook should be here. If it is not, use the wheel until it appears. Once the hook is in the control room, move it once to the left using the wheel. If you go left to the block room you will see the hook hovering over the completed horn. Use the left lever on the left control panel and push it down. 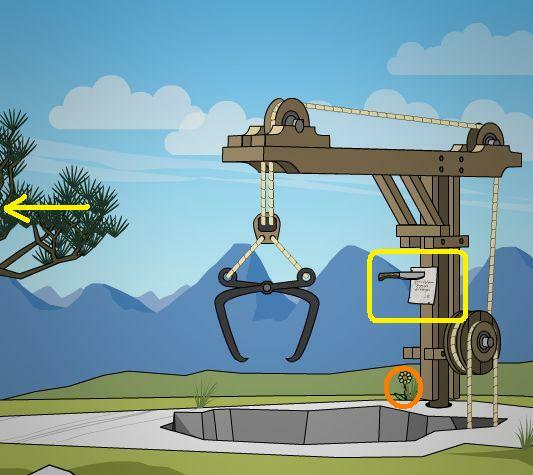 Use the wheel once to the right to bring the grappling hook to the right. The grappling hook should be in the room where you are, and it should be holding the unicorn horn. At this point the sled is directly beneath the hole here. You could use the right lever to lower the grappling hook, but you don't need to. Use the left lever to open the hook and the horn will drop down to the sled. 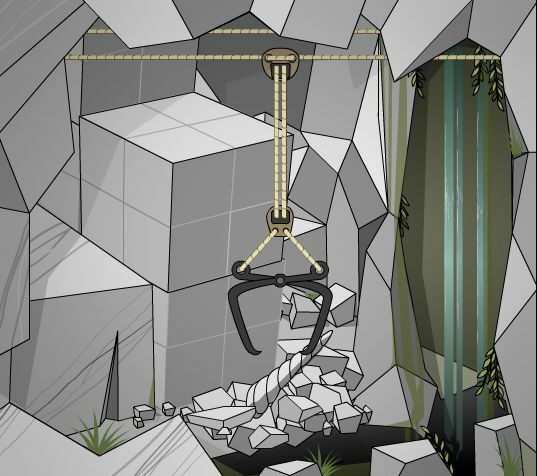 Use the wheel to move the grappling hook to the left TWICE (as far left as it will go). 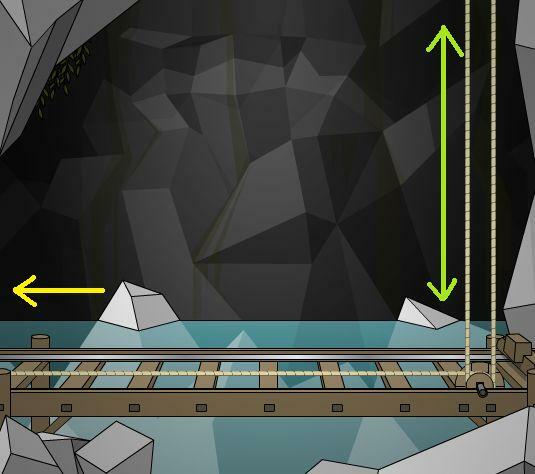 Although you can't see it from here, the upper grappling hook has lowered all the way to the lower level, and the sled has moved all the way to the right. Use the left lever to close the grappling hook (you won't be able to see the effect). 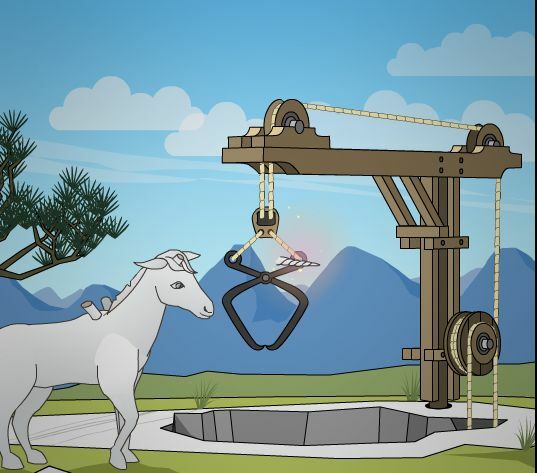 Use the wheel to move the grappling hook as far to the right as it will go. If you do this correctly, Bruno will get his horn. Go left to the block room. 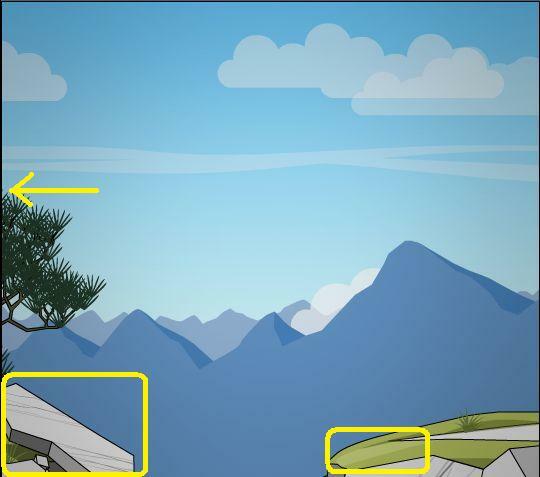 Use the book to create one of the wings, then follow the same steps to move the wing down to the sled then up to Bruno. That is, pick up the wing, move the hook to the control room, open the hook, move the hook twice to the left, close the hook, move the hook 3 times to the right. Each time you repeat the sequence (after carving the wing) Bruno will get his wings. Here are the patterns for the wings. Once Bruno has all of his parts, go right to the stairs, then up the stairs. Go left three times to the outside stairs then up to the telescope. Go right four times to Bruno. Click on Bruno once and he will bow down. Click on Bruno again and he will fly you away. There are six secrets to be found. Looking through the telescope at the mountains. Finding the paper in the back of the book (using the knife). Finding the paper in the secret compartment in the box. Specific instructions for carving each head (with screenshots) can be found in the main walkthrough. There are 18 flowers in the game, collect all to make a perfect bouquet. There are two flowers in the scene with the telescope stand. There are two flowers in the outside stairs to the quarry floor. 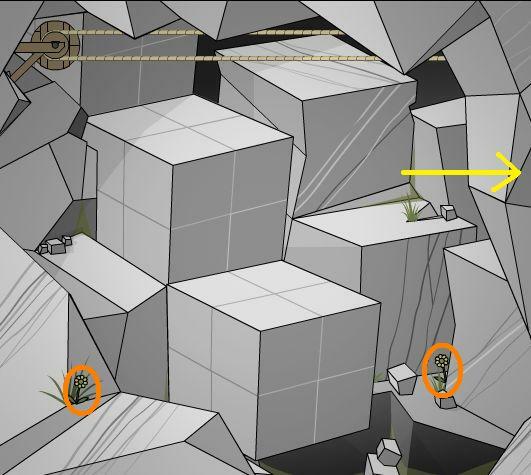 There are two flowers in the waterfall scene (quarry floor). 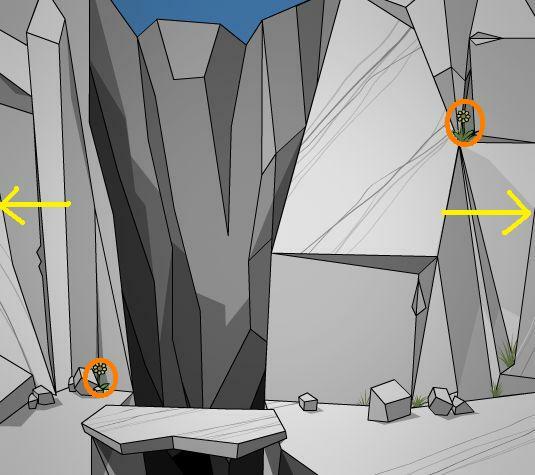 There are two flowers at the chasm (quarry floor). There are two flowers at the dead end (quarry floor). There is one flower at the cave entrance (hidden by the blocks). There is one flower at the upper crane by Bruno the unicorn. There is one flower at the base of the stairs into the cave. 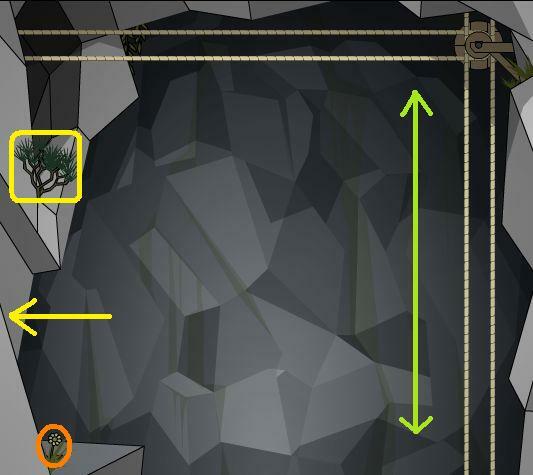 There is one flower at the dead end on the right upper level of the cave (where the second crane comes down). There is one flower in the block room with the waterfall. There are two flowers in the second block room. There is one flower in the alcove behind the gold bird. So I'm kind of stuck and the in-game Walkthrough link redirects here, a page with no walkthrough or comments (yet). I've found two coins lying about and put them into the bird's bowl, put I'm apparently missing a third one and can't find it anywhere. Also, I've made a horn and a wing for the unicorn, it seems to be missing a second wing, but if one more, it get's crushed as soon as I leave the screen. How did you manage to make a horn and a wing for the unicorn? I am completely stuck at this point. 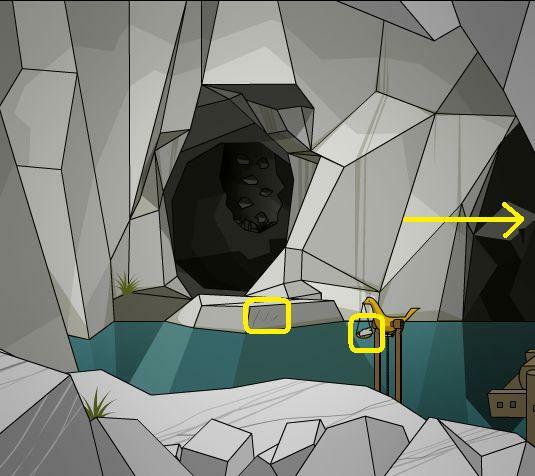 Also, if I remember correctly, the third coin is under a rock along one of the screens at the bottom of the quarry, along the track. I think. Honestly I forget exactly where I found it but I do remember it wasn't hard to find. There are two different wings, and each has its own pattern. You need to find more note pieces to find the second wing pattern. I can't get anything made, either. I've found the patterns on the note, but I can't figure out how to move the blocks. Nm. I figured out how to make stuff. I was just messing up the pattern. This is a beautiful game but I am getting bugs. When I gathered the unicorn's horn and wings, the unicorn disappeared when I moved the sled and pulled them up to the unicorn. Also when I had the giant hand exposed, the grappling hook, would go to pick it up and the hand disappeared. Please fix, I quite after several tries. Hmm found a weird glitch. I saved my game and closed the window. Then when I came back and loaded my saved game, the bird with the gold coins at the bottom of the quarry was gone, and the crane mechanism didn't work correctly anymore. I would spin the wheel and first the crane would not move, then it would move suddenly two screens. Very strange. I'm going to restart from scratch and see if that fixes it. I beat it, but only got 1 of 6 secrets. Never did figure out what to do with the pattern of the hand. Guess I'll play through again and see if I can figure out a couple more of the secrets. Finally beat it, but only with 2 out of 6 secrets. I'll definitely replay to see what I can figure out! ...then the path forward was opened for me. After a little bit of work, anyways. Having trouble finding either the stone slab to move or where to input pattern. 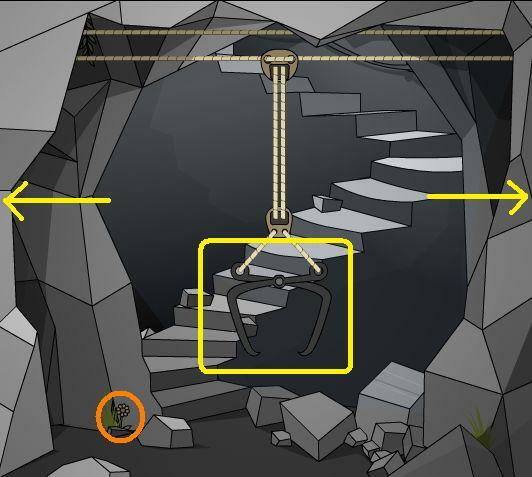 Unlocked lever at top of stone ladder but cant figure out what it unlocked. Any help? can't find third coin. found two under rocks. one by unicorm and other down below. eh? Am i doing something wrong? The patterns unrelated to the unicorn doesn't seem to work. Cams - I had the same problem. I imagine we are probably missing something which would make those patterns relevant, but I'm not sure what. where can I make the horn and the wings? Cams - There's a reason there are two rooms with blocks to cut. In the meantime, I've having trouble on my second play-through. Apparently I was lying before when I talked about the coin that was out in the open, because I can't find it this time. Can anyone tell me exactly where it's supposed to be? I hope it's not a glitch like some people have reported. I'm stuck at the crane as well. :/ Something's just not clicking for me. Im looking for third coin too. got unicorn one from under a rock. and another from the bottom under a rock. The last I know not where. Can someone please be more specific about the coins? Other game-crit stuff, not really spoilery. Slight bug: I have a madly double-clicking mouse, and at times water is flowing when it shouldn't (including downstream) and vice versa. Cool thing: You can get the paper from M two ways. I love that. Great ambient sounds and music. I tried to replay this from a saved game, and I found a secret, but things have gotten buggy. When I carve anything, the image of the original block stays behind the carving, and now the crane won't go into the carving room. Asmora-I noticed the second block area. I tried various things but nothing worked. Got the mallet, 12 flowers, 1 coin, knife, note, key. I assume the next step is to move those big three stones out of the way, or do something with the claw, but nothing seems to be working. You're missing something on the staircase coming from the stand at the top. What you're missing is the chisel. I'm not sure how you got a coin without the chisel, though. Asmora, you don't need it. Just pick it up with your hands. 1. Use the telescope to look at the mountain. 2. In the room with the chest, use the key on the chest, then click on the top half of the chest to reveal a secret compartment with another note. 3. Collect all 18 flowers. As for the rest, and what to do with the foot and hand and such I am still stumped. I tried carving them in the second room with the large blocks, but they wouldn't work. I have no idea what I'm missing.
. The marble did not break up when I had finished carving. , the last mallet-smack destroys the block instead of finishing the pattern. You have to move the cart/cranes to find the third coin. If you don't move anything, it's underneath where the cart starts out on the track down below. You can move it just once in any direction and you can see it. Still stumped about the hand and foot. I'm thinking that the final piece of the book must be somewhere, but I have no idea where. Any ideas? After loading my saved game (in which I had made and transported one wing), I found that both the unicorn and the wooden claw-structure thing behind it were gone, although the hole was still there. The claws themselves are also buggy, disappearing and duplicating, etc. Help? Using Firefox, if it matters. I made, the ram's head, it sparkled, so I think it's a secret. It then disappeared after moving screens. Can't make the King's head. Wow, without the last piece of note book. I managed to create the missing object in the notebook. It's one of the secrets. How am I supposed to cut the blocks to make the patterns? I can't figure it out. Where do you get the blocks to cut? I have all the patterns but I don't see anything to carve. YES. COMPLETED. 6 OUT OF 6 SECRETS. WITH 18 FLOWERS. Too bad I can't write walkthroughs for beans. use your mallet and chisel on the stones. Aaaagh! All I have to do is figure out how to make the King! I am soooo close. Has anyone gotten this yet? Out with 6 out of 6 secrets and 18 flowers. Look at mountain with scope. Find note inside of treasure box lid. Find note inside back cover of book. Use knife to find. Make woman out of stone. Click top front square lots of times. Same game, no saving. The second wing (I assume I need two?) gets carved but then it disappears once the claw gets in its screen. Also, the right lever stuck for a while, even though I think it was un-stuck. Hello, everybody! Many thanks for the bug reports, they help us a lot with fixing the save issue. We are working on it. @ Shudog: this is perhaps not a bug. Have you notived that there are 2 different wings with 2 different patterns? Imagia 3 crushes redundant pieces on purpose. @ mickybean: sad to hear that. Is it solely save/load related or anywhere else in the game? We are still checking it, but it appears that the reason for nearly all problems is the reloading not working properly. For this we should have an invisible update soon. Anything else would be helpful to hear about. I didn't know I could carve the rocks with the chisel and mallet. Everything else I was supposed to chisel or knife or whatever had a changing cursor. When I saw there was no changing cursor over those blocks, I just assumed I wasn't supposed to carve them with the chisel. I got lost for quite a while because of that, thinking there was something I'd missed. Not really a big issue, I just think that if the cursor changes with some things you interact with, it should change with everything you can interact with. New version up (v1.0.2) that fixes the save/load issues. Just refresh the page and you should get the new version. Well, I've reached a dead end. the rocks to the right of the wooden mechanism in the stream. i also found a bug. i can't move the lever even if my telescope is standing in the right position (to the left). falling asleep, i'll try again in the morning. I'm having trouble loading the game. I've tried Firefox (w/ adblock disabled), Chrome, and IE, and have updated Flash - no dice. I can load the other Imagia games, just not this one! Is it just me? Jennifer- I'm having the exact same issue. I've had no luck loading the 3rd game either, though the first two load fine. I've tried Chrome, Firefox and Safari. I keep losing my mallet and chisel. There seems to be a bug. When you use an item from the inventory it is replaced by a circle of radiating lines (bit like a clock face) If you are using the mallet and chisel then click back on the inventory to put them back they disappear and you can't get finish the game. Met the bug: I carve the wing at the leftmost screen, roll the claws there, but by the time it bets there, the wing disappears and there's a fresh cube of stone in its place. Not a bigge though. @ bioLarzen: great reports, thanks a lot! If you want to join our beta testing team, mail me to [email protected], please. > there's a fresh cube of stone in its place. When you leave the room, the stones fall down and crush the non usable objects. Admittetly, this is a bit weird, but somehow we had to get rid of all these other objects ;) We'll look into the other issues. My bet is this would've been rated higher if it had arrived bug-free. Summer's a bad time for this sort of thing, there are always new flash games to push it down the page. Tough luck. I'm having the same load issue. I was able to load both Imagia 1 and 2, but the third just gives me a white screen. I use Safari. Was thinking it was running slowly (5-10 seconds for scene transitions) and I have a reasonably quick PC. I think the Vodafone ad on the right is the problem as it is killing IE - ironically I have had the same kind of problem (but alot worse) from a Microsoft Office banner ad on another site. Reduced my browser window size so Vodafone ad isn't visible and your game now plays fine, so I suggest you talk to Vodafone about the techical 'quality' of their ad. On a more serious note, whether or not the water flows goes out of synch with whether the gate is open or shut. Just a minor glitch, that didn't affect gameplay: I had saved the game and then finished it (with one secret: the view of the mountain). Then, I loaded my saved game and got all of the secrets, including the mountain, which sparkled again. When I finished the game this time (with all the flowers as well), it said "You have discovered 7 of the 6 secrets!" Otherwise, great! I'm looking forward to more from Kayzerfish! I made the first wing and put it in the trolley. then i made the horn and put that in the trolley, but the wing that was in the trolley had disappeared. Ok, so i assume the trolley only takes one object at a time so i lift the horn to the surface. then i make another wing and lift that to the surface. Then i still need another wing (the 1st one disappeared), so i make one but it gets crushed - i guess cos the game knows i've already made 2 wings. So i'm stuck with only one wing - do i have to restart? The wing that was successful was the first type of wing. i am now making the second type of wing, the slightly harder one to make, and it keeps getting crushed. This is not a bug or a glitch. There are two different patterns for the wings, one right and one left. If you keep making the one wing it will keep getting crushed as a duplicate. There's another piece of the notebook you need to find to get the pattern for the second wing. After giving the three golden coins to the bird, the bridge (a rock) rose from the water, but no matter where I click -- other side, mountains symbol, anything -- I can't walk across. It just zooms in on the bird. I checked the walkthrough, and it looks like I've done everything I'm supposed to do. This is pretty frustrating. I enjoyed the game up to this point, but judging by this and other comments it's pretty buggy. I'm checking out the bug right now, but haven't encountered it yet. 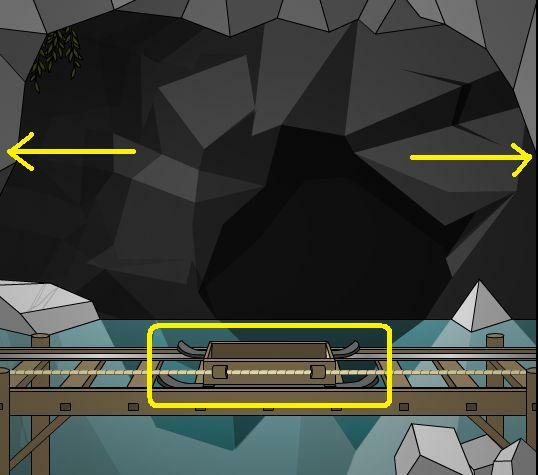 Clicking on the opening to the cave at the back of the new water steps to enter it? Sometimes flash games can stop working properly if your browser cache needs clearing. Also, can you please tell us which browser and operating system you're using?